What Variables Impact a Video Localization Quote? First, do you have a final script that has gone through all of your edits, approvals, and sign-offs? Has it been culturally assessed? What is your turnaround time—will it be a rush job? Not surprisingly, if you have a polished final script ready and are not pressed for time, it will translate into a less expensive quote. If you do not have a script but need it transcribed, and then translated with all the attending requirements, the cost in time and money will increase. For subtitling, dubbing, and captioning, CMI factors the length of the project in creating the quote. Longer projects will be more expensive, as it is more time consuming to localize them (think more studio time, additional talent booking etc.) Most vendors have a per-minute rate that they apply to the run-time of your original content. It is important to note however that this per minute rate is a reflection of both fixed and variable costs and thus should not be blindly applied to any length of video for an estimate. Certain languages are also more expensive than others. This can be due to either lesser demand overall for a particular language or a temporary drop in capacity of voice talent in the market. For captioning, we need to consider the cues and sound effects that often are not part of the verbal script. Are we capturing a thunderstorm, or maybe a loud gust of wind? A door slam? Are there many key sound effects like this that must be taken into account, and how can you tell which ones are worth including in captions? We can help. Readability is also a factor for both subtitling and captioning. An average reader can typically absorb 12-16 characters per second. We also take into consideration the language and genre. For example, we would slow down an animation for children, but keep a reality segment at a fairly fast pace. Depending on the specifics of your video, the above factors will influence the time required to finalize the captions, and will indirectly affect the quote. Dubbing is the most complex and exacting process, and the caliber of the actor plays a critical role in the quality of the synced performance. Of course, famous actors will be more expensive. We also consider genre; for a humorous piece, we’d hire someone with experience in comedy to preserve that nuance. Even the type of roles are taken into account. For a recent Spanish tele-novella, we hired actors who had experience with this genre. The number of actors employed will also impact the quote. If a client wishes to have a different actor for each of the original characters (versus one actor for all, which can be achieved with great results), then this will increase the cost. Engineering to create the final mix is also a key component in dubbing. There are many elements that can and should be taken into account, including adjustments of sound levels and sound effects, adjustments to speed of video to better sync lip movement to audio etc. All this requires both expert sound engineers and the commensurate amount of time, with the obvious impact on final cost. 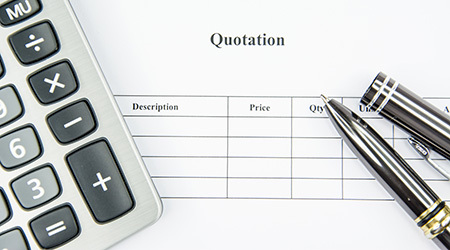 A number of factors go into a price quote for localization. It’s part art, part science, and yet it is wholly quantifiable and wholly explainable. You should not accept a quote with any doubts left in your mind. At CMI, we consider many details to deliver quality localization for our clients and will walk you through each aspect of the project and quote. Contact us today to take the mystery out of pricing your project.